Welsh band Manic Street Preachers are, in the succinct words of bass player/lyric writer Nicky Wire, “the last band standing”. What he means by this is apparent by the manner in which Wire – and his guitarist/vocalist brother in arms, James Dean Bradfield – manages to be both disarmingly straightforward and almost apologetically resilient. Welcome to the Wire and Bradfield show, a two-hander that took place recently in a posh Dublin hotel. It featured two smartly attired gentlemen from arguably one of the most important bands of the past 20 years, discussing relevance, tradition, integrity and how to nip nimbly into middle age, and a semblance of dignity, without losing sight of their original, rigorously intellectual manifesto. Some might recall the band’s early days, at the start of the 1990s, as a quartet of ambitious schoolfriends from the small Welsh mining town of Blackwood. With a love of The Clash and a pocketful of dreams, they decamped to London where, upon signing to Sony in a blast of rhetoric and a dust of make-up, they declared that they would release a debut album of such cataclysmic proportions that it would sell millions. And that they would then promptly split up. Clearly, such a credo was not adhered to, but as the years passed certain things happened that not only added weight to their original well-meaning (if sometimes ridiculously off-beam) claims, but also lent them an almost mythic status. These included songs such as Motorcycle Emptinessand Life Becoming a Landslide, albums such as The Holy Bibleand Everything Must Go, and, in February 1995, the disappearance of the band’s original lyricist, Richey Edwards, the cognitive force behind the above-mentioned albums. 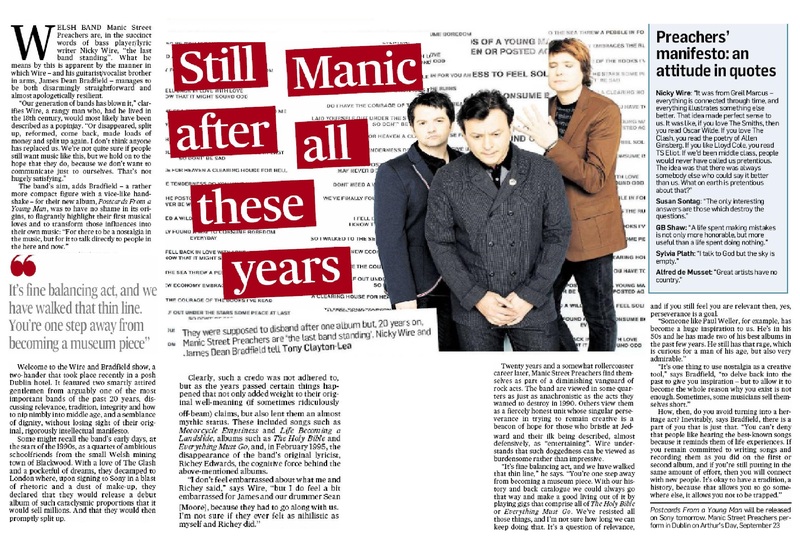 Twenty years and a somewhat rollercoaster career later, Manic Street Preachers find themselves as part of a diminishing vanguard of rock acts. The band are viewed in some quarters as just as anachronistic as the acts they wanted to destroy in 1990. Others view them as a fiercely honest unit whose singular perseverance in trying to remain creative is a beacon of hope for those who bristle at Jedward and their ilk being described, almost defensively, as “entertaining”. Wire understands that such doggedness can be viewed as burdensome rather than impressive. “It’s fine balancing act, and we have walked that thin line,” he says. “You’re one step away from becoming a museum piece. With our history and back catalogue we could always go that way and make a good living out of it by playing gigs that comprise all of The Holy Bibleor Everything Must Go. We’ve resisted all those things, and I’m not sure how long we can keep doing that. It’s a question of relevance, and if you still feel you are relevant then, yes, perseverance is a goal. This page was last modified on 15 September 2018, at 10:34.